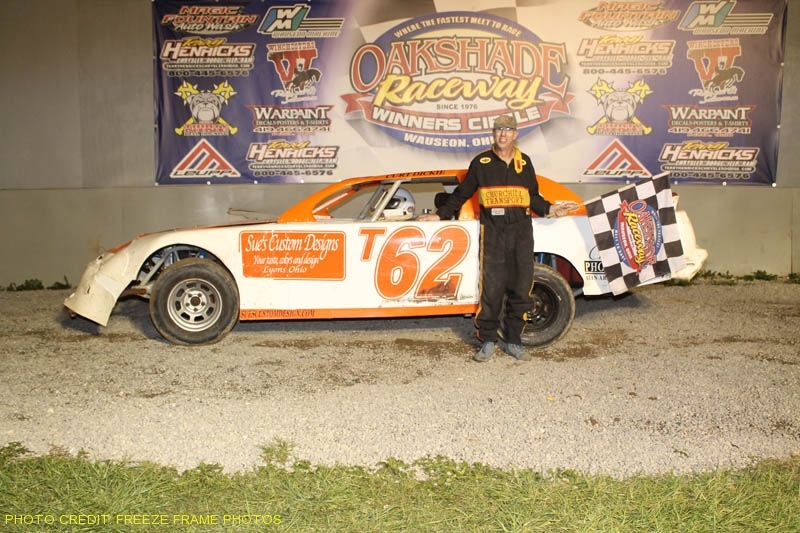 Dona Marcoullier and Mike Jessen each picked up their first feature wins of the year on Wallace Racing Products night on Saturday and John Brooks overcame some late race spins to win the 200-lap Enduro race on Sunday afternoon completing an action-packed weekend of racing at Oakshade Raceway. Houghton Lake, Michigan’s Dona Marcoullier drew the pole starting position for the Wallace Racing Products UMP Late Model feature and took the lead over Devin Shiels at the start. Rusty Schlenk slowly closed in on Marcoullier during a long green flag run while working traffic. Shiels also closed in and knocked Schlenk back to third just before a caution for Casey Noonan’s spin on lap 21. Marcoullier held off Shiels the final four laps to earn the victory. Brian Ruhlman passed Schlenk to finish third and Schlenk’s fourth place finish was good enough to maintain his lead in the Oakshade UMP Late Model point standings. Dusty Moore finished fifth. The first three laps of the Wallace Racing Products UMP Sportsman feature had three different leaders. Tim Fisher passed Brad Mills to lead lap one. Tim Line then got by to lead the second lap and finally, the 2008 and 2010 track champion, Mike Jessen, took the lead. Jessen began to pull away, but a slew of caution flags kept tightening up the field behind him. In the end, Jessen won easily over Bruce Stuart and Tim Fisher. Bob Gregory improved to finish fourth after starting 13th which was enough to lead the point standings. Last week’s feature winner, Matt Lindsey, finished fifth. Terry Rushlow was another driver looking for his first feature win of the year and held the early lead in the Wallace Racing Products UMP Bomber A Main. Garry Domoe was running third when he spun and brought out the caution flag on lap two. Rushlow spun while battling with Jeff Foks for the lead shortly after the restart to bring out another caution period that sent Rushlow to the tail. Foks took command of the race on lap four and never looked back. He led through multiple cautions all the way to the checkered flag to pick up his fifth A Main win of the year. Curt Lancaster started 10th and ended up finishing second ahead of Tony Tolles. Rushlow worked all the way back through the field to finish a respectable fourth with Jeff Geis ending up fifth. Brandon Myers started on the pole of the Wallace Racing Products Hornet feature event and led the first four laps until “Sparky Marky” Gillingham closed in and finally took the lead on lap five. Thirteen-year-old Gillingham went on to pick up his third feature win of the year. Myers finished second followed by Drew Smith, Josh Froelich and Maverick Wright. Next up was the main event for the brand new UMP Sport Compact division. Derek Morris led from flag to flag in the Wallace Racing Products feature with early pressure from Stephanie Miller. That pressure ended after Miller’s car abruptly turn right in turns one and two and flew over the the banking which brought out the only yellow flag in the race. Morris continued on his way to feature win number four on the season. Regan Ford and Rich Fowler had contact on the final lap sending Fowler spinning down the backstretch and giving Ford the second finishing position. Fowler settled for third with Miller ending up fourth. Rick Dixon held the lead for most of the Wallace Racing Products UMP Bomber B Main until Chris Keller and Danny Hogrefe closed in near the finish. The three drivers raced three-wide for the lead for a couple laps until Keller finally got the lead at the white flag. Keller held off Hogrefe to take the victory. Dixon settled for third followed by Dan Dippman and Jim Remley. Mike Plotts Jr. in the “Redneck Express” took the final checkered flag of Saturday night in the Wallace Racing Products UMP Bomber C Main. Plotts started on the outside of the front row and immediately gained the lead. Plotts led the entire distance earning his first feature victory. Dylan Hough finished second with Justin Woodruff improving nine positions to finish third. Chad Zuver and Mike Draper rounded out the rest of the top five finishers. Drivers in Sunday afternoon’s 200-lap Enduro had to contend with changing track conditions, other drivers and steamy temperatures. Mike Plotts Jr., Dan Dippman and Brian Ruhlman each held the lead within the first 25 laps of the race. By lap 50, John Brooks settled in to the top spot which he would not relinquish the rest of the way. Ruhlman had a fast car but kept dealing with oil loss which caused him to make multiple visits to the pits. Nick Fenner had peaked up to the second position by the halfway point in the race, but Chris Williams took that spot away by lap 125. Williams was unable to make up the distance on Brooks who had a couple scares within the last ten laps of the race. A pair spins almost cost him the race, but Brooks was able to get going after each one. Brooks never stopped in the pits during the race and became the third different Enduro race winner of the year at Oakshade. Williams finished second followed by Fenner and Ruhlman in fourth. Steve Dickman finished fifth. Saturday, June 16th is Leupp Outdoor Equipment Night featuring the American Late Model Series paying $2,000 to the winner. UMP Sportsmen, UMP Bombers, Hornets and UMP Sport Compacts will round out the evenings competition with gates opening at 4pm and racing at 7pm.